We provide sports, recreation and activity for a variety of ages. You'll find us conveniently located on Ferntree Gully Road, just five minutes from Eastlink. Making us easily accessible from Melbourne's Eastern and South-Eastern suburbs. 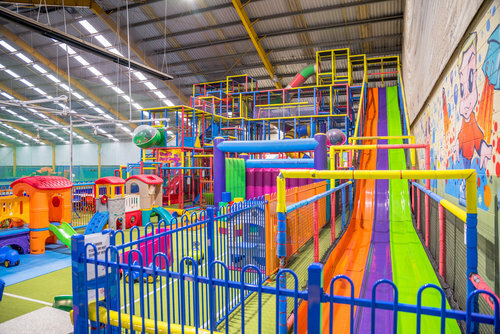 Our facility includes three large rubber multi-purpose sports courts, two cricket training lanes (With Bowling Machines), a fully licensed bar, function space and Australia's Tallest Indoor Play Centre! Activities at the venue include Mens Futsal, Mixed Futsal, Mens Indoor Soccer, Ladies Netball, Mixed Netball and Dodgeball competitions. We also run Bubble Soccer, Nerf Wars, Bow Tag Archery, Kids Parties, Birthdays, Functions, School Groups, Sporting Club Events and Cricket Training. Futsal, Indoor and Netball Competitions run Sunday, Monday, Tuesday, Wednesday and Thursday Nights from 6:20pm.